Do you believe in resurrection of body? Let us read what the Bible says about this. 1 The hand of the Lord was upon me, and he brought me out by the Spirit of the Lord, and set me down in the midst of the valley; it was full of bones. 2 And he led me round among them; and behold, there were very many upon the valley; and lo, they were very dry. 4 Again he said to me, “Prophesy to these bones, and say to them, O dry bones, hear the word of the Lord. 5 Thus says the Lord God to these bones: Behold, I will cause breath to enter you, and you shall live. 7 So I prophesied as I was commanded; and as I prophesied, there was a noise, and behold, a rattling; and the bones came together, bone to its bone. 8 And as I looked, there were sinews on them, and flesh had come upon them, and skin had covered them; but there was no breath in them. 10 So I prophesied as he commanded me, and the breath came into them, and they lived, and stood upon their feet, an exceedingly great host. 29 and come forth, those who have done good, to the resurrection of life, and those who have done evil, to the resurrection of judgment. Bible quotes from a preaching by Fr. Xavier Khan Vattayil, Sehion Ministries, Attappady, Palakkad, Kerala, India. 13 Now on that same day two of them were going to a village called Emmaus, about seven miles from Jerusalem, 14 and talking with each other about all these things that had happened. 15 While they were talking and discussing, Jesus himself came near and went with them, 16 but their eyes were kept from recognizing him. 17 And he said to them, “What are you discussing with each other while you walk along?” They stood still, looking sad. 18 Then one of them, whose name was Cleopas, answered him, “Are you the only stranger in Jerusalem who does not know the things that have taken place there in these days?” 19 He asked them, “What things?” They replied, “The things about Jesus of Nazareth,[h] who was a prophet mighty in deed and word before God and all the people, 20 and how our chief priests and leaders handed him over to be condemned to death and crucified him. 21 But we had hoped that he was the one to redeem Israel. Yes, and besides all this, it is now the third day since these things took place. 22 Moreover, some women of our group astounded us. They were at the tomb early this morning, 23 and when they did not find his body there, they came back and told us that they had indeed seen a vision of angels who said that he was alive. 24 Some of those who were with us went to the tomb and found it just as the women had said; but they did not see him.” 25 Then he said to them, “Oh, how foolish you are, and how slow of heart to believe all that the prophets have declared! 26 Was it not necessary that the Messiah should suffer these things and then enter into his glory?” 27 Then beginning with Moses and all the prophets, he interpreted to them the things about himself in all the scriptures. “If Christ has not been raised, our preaching is useless and so is your faith” (1 Cor. 15:14). If Jesus Christ did not rise from the dead, everything else is a waste of words. Jesus has risen from the dead—as our Savior, and as the promise that we will also rise from the dead. 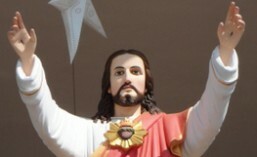 Resurrection of Jesus is one of the major evidences that Jesus Christ is the Son of God. Do you like this video? A group of faithful parishoners imagination and hard work. Jesus’ resurrection represents an assurance that we can have forgiveness from our sins.